While we were visiting my family in Oklahoma over the Christmas holiday, we got to visit with cousins, aunts and uncles, as well as siblings, nieces and nephews and my dad. As I was visiting with one of my cousins on one of the days we were there, she began telling me a story about finding an old childhood school project in a box that she was looking through. The project was to write a true story. I believe she was around 9 years old when she wrote a story about a family vacation that we shared with her. She told me she loved reading the story and it brought back memories. When she told me the story, I honestly didn't even remember the details that she shared in the story. The story was a funny one, and she recalled that the teacher questioned her on whether the series of events discussed in the short story actually happened because they were so outlandish. But, knowing our family, of course we believed the story was true. I loved that there were different details that she remembered from that vacation, since she was so much younger than me. When she told me about that story, it really got me thinking. How awesome would it have been if I had kept a journal during my childhood? There are so many memories, of course, that I have stored in my head. However, there are also many details that I don't have stored. Yet, had they been jotted down while fresh in my memory, I could now have them to treasure. More than I wish that I had my own memories jotted down, I wish that I had my mom's thoughts, daily struggles, daily joys, and much more in the form of a journal. My mom is no longer alive, and I cannot ask her about these things. Not only that, but although she had an impeccable memory, there is no way she would have been able to describe the exact feelings she was having on a day when dad worked 12 hours and she had the four of us kids under 4 at home to take care of. I mean, she could give me an idea, but I want to know the details! 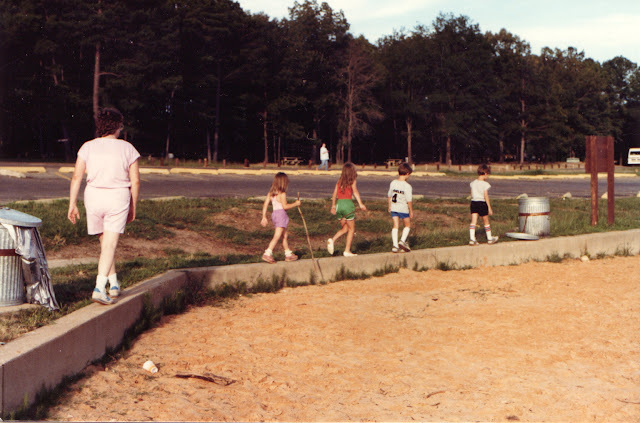 My mom and us four siblings playing follow the leader. Jason was in the lead, followed by Jeremy, me, Holly and then mom.